Let me preface this by saying this is not my work, it is that of a fellow Jeeper who wants to share his trials and testing at no charge to anyone. Please feel free to download the file below and go your hardest!!! I will update soon with my own pics. Not lifted yet, but coming!! UPDATE: Thought it was about time… Lift was installed at 12,000km and now up to 43,000km and no issues whatsoever. Can’t wait to see it lifted! why are u lifting it ? Just needs a little bit more ground clearance. I now have the 245/70 r17 Goodyear Duratracs on it which nets a a 1/2″ lift, plus this mod will lift the underbelly a total just shy of 2 inches from stock. I do quite a bit of beach driving in really deep soft sand and dragging the belly whilst trying to tow a 1 tonne caravan does not help! I would be very interested in the results for getting my 2014 Trialhawk a little higher out of the sand. Me too! Well, a little higher over everything, I guess. Yep had a wheel alignment done straight after. Tow in was off front and rear but camber was still in spec. Great to hear! Thanks again. Lift kit looks good. Did you notice a response difference to the adaptive cruise control etc with the non-spec tyres? Also, what brackets did you use for the light bar? Hey Miles, no noticeable difference in handling or electronics with either the lift or the tyres. In fact the speedo is now acurate where as before it read a few km above actual speed. The light bracket is a home made one and I will post up some info on it shortly. Just 3mm x 30mm flat gal strip bent to shape with a crossbar behind the front number plate. Thank you for the reply and info. Will play around with the bracket when the wife goes away for the weekend. Planing on a trip from Sydney to The Rock and Alice in 2018 so will change tyres before then and hopefully the lift kit will be in place as well. The front bars on sale in the US all look like reducing front departure angle. 1″ plus the larger tyres I reckon will be all i need to go most places. 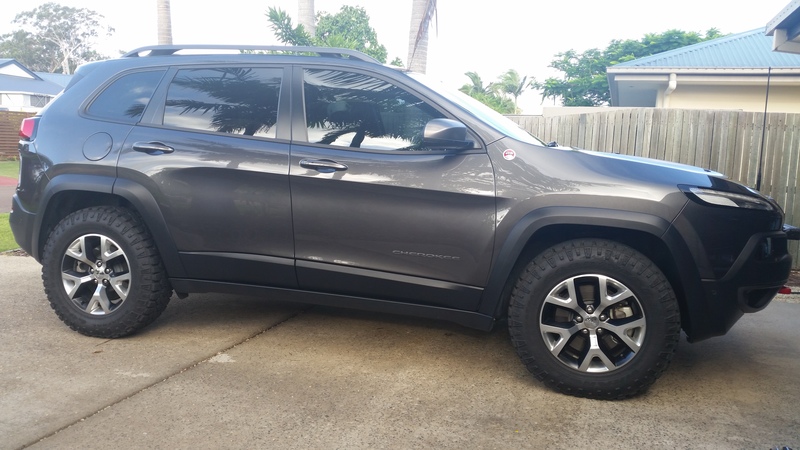 Hey guys can the Aussie lift work on a 2014 cherokee limited??? Im also looking to lift it a bit and go with bigger off road tires!!! Most certainly can! Had been fitted to all the models now with no issues. Hey Miles, hope you are having a great start to 2018! Just an update on this for anyone else following, the KL Trailhawk now has MC rating, backdated to first manufacture. They will not be issuing a new compliance plate, but have been sending out letters for owners to carry. The new models from (I think) January this year now have the new compliance plates fitted. Great news regarding MC rating. I hadn’t noticed it in the press or magazines and yet to receive letter – so thank you for advising me. Because of a lease, with no MC rating I avoided the lift and larger tyres (also insurance). Just fitted Nitto TerraGrabber2 size 245/65/17. Good price at $240 each fitted and 4th one free. Will now be looking at the lift kit. Will this lift work for a 2017 cherokee Limited? This has been fitted to all models now with no probs, there is no change in the 2017 models to the suspension so you should be good to go! It is also easily reverse it should you decide against it too. Any rubbing issues under load with these tyres Dave? Hi Steve, sorry for the slow reply! No rubbing at all under load, and very minor rubbing when turning when the tyres were new. As in, they polished the dirt off the inner guard. After about 5,000km they no longer rub. Mind you, after 40,000km they have only used average 1.5mm of the 12mm tread, so it didn’t take much to cure the rubbing! 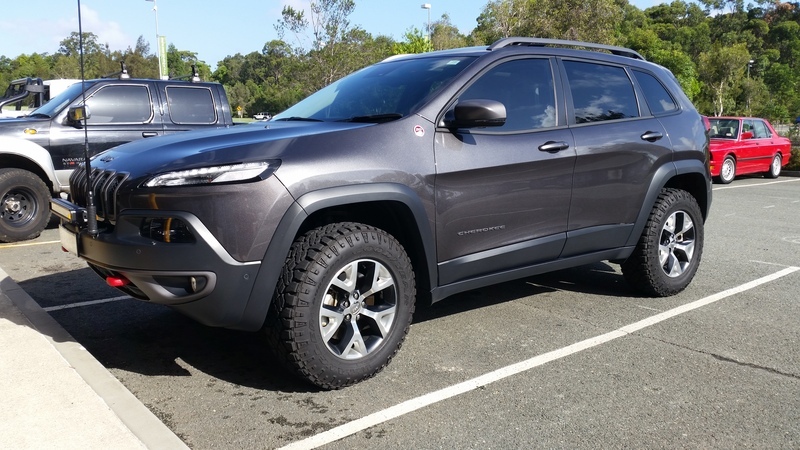 Hi There… been reading this thread and it gets me going… I’ve got a Jeep Cherokee Longitude, I understand that you guys are referring to the Trailhawk in this particular discussion, Can my Longitude be lifted as well with no issues to encounter in the future, and if so where can i get it done, I live in Sydney, also, does anyone know if there is a recovery point in the Longitude, or is it possible to install one… thanks you guys in advance for any input. This style lift has been fitted to all models now so no problems with fitting at all. There are also a few ready made ones now, the Hazard Sky version (same as this but custom made spacers available in 8 or 12mm in polythene or alloy, plus includes a preset gap tool for the front in 19mm or 25mm and a new pinch bolt for the front), the MFC version (similar concept but goes for one large alloy bottom spacer at the rear and includes a clamp to go around the front strut to lessen the chance of the strut dropping back down or bending – not really a chance of either to be honest and there has been many a heated debate over the matter!) and finally a full new spring and shock/strut package from Dobinsons for 4 or 5 times the price – not sure if anyone in Australia has installed this one yet! As for the install any competent mechanic or mechanically inclined friend should be able to do it, took me a couple of hours in the garage with hand tools. You will need a 4 wheel alignment immediately after the lift as the toe-in on both front and rear increases substantially. Recovery points – no, unfortunately they did not include them on the non-Trailhawk version for some bizarre reason. I have only seen one or two people around the world attempt to fit the hooks, on the front it is a real mission as the whole front bumper has to be removed and anchor points attached then holes in the bumper etc. The rear about the same, unless you have a towbar then you can just use a towbar mounted recovery point. Hi Nat. There seems to be a lot more kits around now than when I did mine! Personally I have stuck with around 1.25in of lift on the suspension and 1in bigger tyres for approx 1.75 in better ground clearance. From testing done many years ago this was determined to be the max without causing undue stress on the drive shaft joints. I regularly do beach runs and tow the van up the beach too and have never had an issue with the clearance. Mine is closely represented by the Hazard Sky kit, which is also about the cheapest without making the parts yourself.